I'm Leaving Town. What to do with my Continuous Brew? Get peace of mind and clarity of information with The Kombucha Mamma Guides. Without the right help, brewing Kombucha at home can be stressful. Instead, make it easy with this instantly downloadable booklet. This book is a fantastic book for new brewers. I refer to it often. I read it in one day because I was so excited to start. Good information and support, esp. about moldy brews (which friends also verify that it rarely occurs if brewed in right condition). Hannah teaches you the right conditions. So glad I read this before starting, as I had my cheesecloth all ready (which is a no-no!). This guide has been so helpful! I use it often, especially when doing something new. I plan on buying the full book in my next purchase!! The guide was easy to follow and provided a ton of information. It is one thing to have all the ingredients to make a wonderful product like Kombucha, but things go so much easier when you have someone take you by the hand and provide the necessary information to make everything 'work'. The book gave me the foundation and the guidance to forge ahead, recognizing that there is someone out there who has been there and done that and has now put the information in an easy to read entertaining guide. Having read this and now successfully producing wonderful Kombucha, my family has now bought me the Hard Cover Big Book of Kombucha so I can go deeper into the workings and understandings of the process and product. Thanks for all your work Hannah. yes yes yes!!! Hannah takes the guess work out of getting started with kombucha, plus her energy and writing style are contagious. Don't guess, just get it right from the beginning with this book and then find your own kombucha groove based on Hannah's guidance. This book was so informative and instructional! Excellent companion to the Brew Now Kit so as to get a beginner started correctly without anything left uncovered and no questions left unanswered! Thank you so much for being so thorough!! The guide book was helpful as are all the photos on the site. This covers all the basics and more. I already had the "Big Book of Kombucha" and this seems like a condensed version of the book. The ebook came with my continuous brewer and I read it as a "refresher course". This is a must have, along with the Big Book of Kombucha. The 2 together make it very simple when first starting off brewing your own. The e-book that came along with my kit is packed full of tons of helpful information. I am so glad I found Kombucha Kamp before I started brewing. This is the way to get started brewing your own kombucha! This information is well organized and thorough. I especially like the download option, saving paper and having the material to read before the SCOBY arrived. Fantastic! So much info! Great book. This is a comprehensive, detailed, and informative guide to making KT. I highly recommend it! It's well worth the five bucks and the download process is simple. This was a great guide. I referred to it constantly while making my first batch of kombucha. You need this to start. Beyond thorough. Very much appreciated the specific information for all steps. A bit redundant but thorough. This is a great resource for someone who needs to have a teacher along their brewing journey. I've loved Kombucha for years but have only been brewing for about a year or so and that means I have a LOT to learn. I have been able to get many questions answered. Excellent book! Easy to follow and answers everything you will ever encounter in making the continuous Kombucha tea. Great for getting started or if you have been fermenting for a few years still very useful. This Handbook is really complete, from History to health benefits all the way thru to flavoring your Kombucha. I didn't know what to expect when I started my first brew, I followed the simple directions, sampled the brew until I was satisfied with the flavor and strenght. Then the moment of truth, bottling, but wait, did I want to start all over again? No, I decided that I'm going to continuous brew. The directions were clear so I removed one bottle and put in a bottle of tea. A few days passed and it was ready again. Except now my new SCOBY was growing quickly so I added 2 bottles to every one that i removed until my system stabilized at 2 gallons in size. Now I am taking one bottle every 3 days. All this on my own, using the manual. Not bad for a first time brewer. Thanks again. There's so much info on the internet, it's really hard to sort through the right stuff - but this book makes it so straightforward and easy. Thanks so much Hannah! Really great instructions and very clear tips and tricks. Made my life so easy! Hi fellow Kombucha lovers. Wanted to write a review of my ***** five star experience with Hannah "the Kombucha Momma" and her business. My Kombucha is now perfected and I'm proud of it. And I have to say it is all due to Hannah. She always answered my endless questions with kindness and patience. My worries over my scoby, too sweet, PH, the list goes on. Hannah's instruction Manuel is a must have. Without a doubt the most informative quick reference I've ever seen. Read it through first then dive in to brewing. I printed out several pages of recipes, tips, ideas to have at hand. So far this guide has been able answer all my questions it is so packed full of info. The printed instructions, video tutorials/demonstrations, and e-book handbook which came with the kit all were extremely helpful and contributed to my feeling equipped to chart the course that I found necessary for myself. With their extensive training materials and excellent customer support, even a 1st-time brewer like me with needs far outside mainstream awareness was able to navigate my way to success. This guide is straight forward and easy to follow. I had the continuous brew system set-up in no time. The information provided was perfect and I didn't second guess myself while trying to get my first batch going. I'm so confident now, I am about start a second continuous brew system. The book covered everything I need to know to start making Kombucha. I feel quite confortable with the process now. Very useful Guide - i've referred back to it a number of times already. so much useful info packed into it! I am new to home brewing and I purchased this book and started right away with a continuous brew system. This book is a must have. Answered all my questions and has educated me and helped me immensely! MY Kombucha Tea is better than any store bought I have ever tasted. In purchasing the deluxe package, it came with the Kombucha Mama Complete Guide to making Kombucha. In reading this, the instructions are clear, easy to follow, and completely answer any question I have about brewing my own Kombucha. It details every step of the process. I find it very helpful as a new brewer. My first order included this book. It is a digital download. I received it shortly after ordering and started reading immediately. Easy to read on my iPad. Very informative. It covers everything you need to start your new "hobby". I'm so glad I found KombuchaKamp (and this guide). KT Brewing instructions on the web are all over the place and when I got started I wanted to know that I was using a trustworthy source that knew what they were talking about. This book is an excellent source of information for everything you need to know to get started and keep going! It's well written -- and with personality! Plus, Hannah has been a great resource for questions via email, and the customer service from KK has been par excellence! This guide is a must have for beginner Brewers, especially if doing CB. I had never heard of a SCOBY hotel before, and stopped brewing years ago when mine died. I don't worry about that now as I already have two spares in the hotel, and have been able to give some away to friends. Great information and put together nicely. I love this book! So informative and useful. I'm so excited about using Kombucha now and can't wait to get started. I started off with a one gallon brewer & did that for a couple of months. 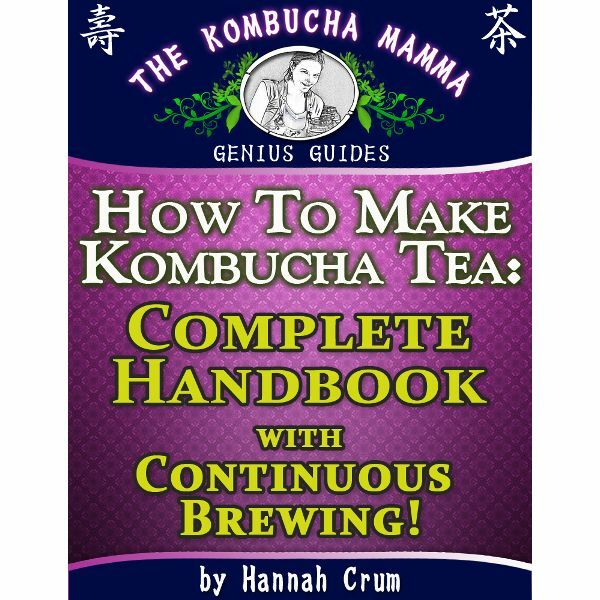 After I purchased my CB, I decided it was time to buy Hannah's book & follow kombucha brewing with more detailed instructions. I learned some valuable information with this book from how to begin with the CB & then how to top off my brew. This book has been an invaluable tool for me & I am so happy I purchased it. This E-Book is extremely helpful. I am a first time brewer and all my questions were answered here. Highly recommended! Thank you! The Complete Handbook is well written, easy to read and understand. A printed version allows for quick referencing and portability. This book is a MUST HAVE for all new brewers. The illustrations are perfect. Also gives great ideas for flavoring your booch, and how to start your scoby hotel. Hannah has thought of everything! Thanks Hannah. The information e-book that came with (my) kit and Hannah's service, knowledge, and patience as we worked thru the purchasing decision making (were) wonderful... Thank you , Hannah! This is an AMAZING resource for an AMAZING price. I had purchased a couple of (expensive) KT guides for my Kindle beforehand...I wish I'd seen this first. It's everything you could want to know! I started a continous brew system with the amazing SCOBY you sent me. The first batch is ready, but now I need to add the replacement liquid when I draw off the kombucha. A great read and invaluable resource! This handbook is chock-full of great information for any brewer or anyone who just loves kombucha and its myriad of benefits. The ultimate guide to not only brewing kombucha, but also the history and properties of this magical drink. you will truly be an expert once you have finished reading this gem. I just wanted to say thanks a million for your fast response and for your superb customer service!! I'm speechless and you guys left me in aw!!! 😮😉I really appreciate that your company is all about truthfulness and customer satisfaction. Just wanted to say THANK YOU GUYS!!! Thank you, I really appreciate that in addition to your excellent Brewing Guide, you have taken time to answer my questions personally. This is a wonderful thing you are doing...and the Kombucha is also terrific! My favorites so far are dried cherry/ Gogi berry and fresh ginger/ lime. I was pleasantly surprised by the quality of writing. The author is scientifically sound, well-researched, sometimes political, sometimes spiritual, and maintains a literary quality. Thank you, Hannah. The service and help provided in getting my brew started and also the feedback on any questions I had, they were answered immediately to help me on my way. No one need to look any farther than Hannah's website. We bought the ebook for making kombucha, which I am enjoying reading. Very clear informative enjoyable video. I was able to make my first batch of Kombucha without any problems and learned alot about kombucha in general. Thank you Hannah. This came with the kit I purchased...and thank goodness!!! It answered all of my fears and helped me become a successful kombucha maker!!! Our whole family drinks it everyday!!! LOVE LOVE LOVE!! I am SO thankful for this manual!!!! This online handbook is beautifully laid out, clear, and really fascinating to read. So far, I've used it as I had questions, but now I'm ready to read through the whole thing. The history, the information on different types of tea and even sugar, the numerous tips, are all just amazing. I feel like I'm stepping into another very welcoming, organic world -- connecting with different people in different times and places, as I delve into all this. Beautifully done, Hannah...!! I started brewing Kombuch years ago and have a continuos brewer, but I stopped a couple of years ago and forgot all about it until I found KambuchaKamp on the net. Hannah has so much info on the whole brewing process that I decided to get back into it, and I'm happy I did! I purchased Hannah's eBook and have been reading it every night enthusiastically! There's so much that I didn't know but am learning now, and it's making the whole experience that more enjoyable. It thoroughly covers many topics from starting a brew to bottling and flavoring. I'm learning so much and it's making the whole experience more fun and pleasurable, not to forget, successful every time! Thanks for this great book Hannah! Thank you! I really appreciate the detailed advice on your web-site, as well as the individualized answers in the emails. You provide a huge service for those just starting out making kombucha. This is an amazing resource! I had it open when I was starting my first batch, and have gone back to it many times when different questions have come up. I'm impressed with the level of detail, but also with the "extras" in it--its not just a brewing manual but a history of Kombucha! A fabulous resource!! Great Book! Should be in a Eastern Civ History class! I keep this on hand at all times for a quick read.. Easy to get going with your first brew. Almost too easy! Def recommend. Loved this book! read it all the way through several times. Very helpful to me as a new kombucha brewer. I attended Kombucha Kamp as I was getting very curious about kombucha but I was scared to death to try it in my own. Hannah explained everything perfectly and erased all my fears. The rest is history. I am enjoying my home brewed kombucha every day and having fun experimenting with flavors. Thanks Hannah! Very helpful e-book. I have been successfully doing a continuous brew for a couple of months now and I love it. Definitely recommend this book! I have been so grateful for the comprehensive guide which was provided as part of the kombucha kit. The different subjects are clearly indexed which makes it very user-friendly. This has made it very easy for me to access any needed information in a hurry. I honestly don't know what I would have done without it. Thank you, Hannah. This book is great!!!! I couldn't have asked for more information on Kombucha! This book is chock-full of so mush information of the kombucha brewing process and beyond. After reading, you will feel like a pro! This book is priceless! SO much information and so easy to use too! The links in the table of contents link right the the section you are wanting to read about. I've used it over and over again and again! Thanks so much, Hannah! i have just downloaded and skimmed through your kombucha guide. i have read a LOT of garbled stuff about kombucha in the last week and i just want to say a huge THANK YOU for your lucid, crisp, easy, wonderful instructions. I started continuous brewing in a 2 1/2 gallon glass vessel with a plastic spigit. In the last month the kombucha has found it's happy place and I'm enjoying 1 1/2 gallons of kombucha a week. I did many things wrong early on. I carried my brewer to the sink to bottle(solved when I bought a stand). I washed my bottles in the dishwasher with everything else (now I run it without soap but on the sanitize setting with just the bottles). All things Hanna suggest worked. The other thing that helped greatly was instead of bottling 8 16 oz bottles at a time every 5 days or so I do 4 16 oz bottles at a time 3 times a week. Monday night, Wednesday night and Saturday morning. The more regular feeding is what really got me where I am today. I am finally getting bubbles in my bouch!! Thanks Hanna for the great products and the wonderful guidance. Great resource; everything I need in one place. Thanks again for your help and giving me the confidence to brew KT at home. Wow!! Very informative. Anything you would want to know about brewing. I will say it's was a bit overwhelming though at first as new brewers, but now reference it often and find what we need easily. Invaluable tool for first timers and even experience brewers alike. This E-book has been sooo helpful, I saved it to a usb so I know I'll always have it to help me out when I need it! I read most of it threw twice already!! I bought a copy of your full e-book/guide, and the information it provided allowed me to get brewing. Since then, I have become my family's own "kombucha mama". My elderly mother swears that having her booch every morning makes her more energetic. As for me, I haven't had a flare-up of my colitis since October!!! To say that I am now a fan of kombucha would be an understatement. I've got a nice 2.5 gal CB set up, as well as a scoby hotel. And tomorrow I'm going to try an experiment on my mother's dog (bichon frise) who is having "stomach troubles": we're planning to slice up an older scoby and add it to the dog\'s food. We'll see what happens! Anyway, the point is, THANK YOU for so generously sharing so much information, and for all your hard work! It is appreciated. This book has all the information you will ever need to make kombucha, and to be able to answer all those questions from your friends about where does this come from, and how does this work, and why do you drink it? Etc. etc. It contains great troubleshooting information, also. Money well spent. Thank you Hannah for sharing your information!!!! This is a great reference. It's very comprehensive. Everything you would need or want to know in one place. Excellent resource. A must-have! This website is the most comprehensive I've found on the net. I just started brewing in June, 2013, and was extremely nervous when I found negative information regarding consumption of Kombucha. Hannah's calm and supportive Customer Service group were very quick to respond to my emails and provided me with the confidence to continue brewing the kombucha. I love the guide, have referred to it continously and have printed it out for future reference. Any question you can think of has been answered in this ebook. Keep up the great work! I had no problems at all with this ebook! Thanks again for everything! I hope to get the continuous brewing before too long when I can afford it! Made it so easy...now, every three days, I pour off 5-6 bottles, flavor (or not) and brew another gallon.Thanx! This handbook is great! It answers all of my questions as a new brewer and even made changing from batch brewing to continuous brewing a SNAP! I have recommended this to many of my friends who are new to kombucha brewing. I love that it is downloadable so I can keep it on my computer for easy reference. This handbook is a GREAT tool to have! I read this cover to cover while I waited for my kit to arrive. It was a quick and interesting read, chock full of fun facts and history, too, and made me, as a first-time kombucha brewer, feel confident to dive in. As a result, my first batch (and the several subsequent batches) was a great success! This book is the perfect resource to answer all of your questions about brewing Kombucha. Very thorough and easy to follow instructions. Love it! I think I have read the book 3 times just to be sure I would make my kombucha right ☺ Of course you can't go wrong with a book like this! The detail and information is great! So nice to have it to reference. I already owned everything I needed for the continuous brew method (except the scoby) and this book was helpful in getting me set up and going. There is a great reference guide for anyone interested in making kombucha. I have been making kombucha on and off for five years now. I used the batch method which was the only way I knew and I only used black tea and flavored with ginger because that was all I knew and that was it. The information I learned here was so complete and inspiring that I now can not wait for each brewing cycle in my CB so I can try new flavors, I have no idea how long it will take to try all the flavors that come to mind but I know I will not EVER get board with the possibilities. I understand tea more and find I love the flavor of green tea so much more and am excited that I can use it. I love the info about the scoby hotel and I could go on and on but buy it for yourself get the information you need to learn how to care and enjoy your kombucha to its fullest! O and by the way I use to like the stores more then my home brew but just could not afford the prices but now I LOVE my home-brew so much more! Thanks KKamp for your wonderful products and inspiration! This book was invaluable for everything from setting up to brewing to the second fermentation. Thanks for the information Kombucha Mamma! Everything you need to know about brewing Kombucha is in here. This book is full of great information. If you are just beginning to brew or need to refresh your skills this is the book to have. I received the guide with my CB kit. I love that it's an ebook, because I'm able to load it on my tablet and keep it with me in the kitchen! It's simple to read and I love the background/history information. Great info, answered all my questions. It didn't flow as nicely as most PDFs I read through, but the info is spot on. I constantly refer back to it when I have questions. Great resource! This has been a huge help in setting up my KT. Thanks for your work! This handbook is essential for the beginner, and anyone looking for easy to understand info on Kombucha. a MUST have for all! I really enjoyed reading this, and it was so interesting learning the history behind kombucha. It was great having a comprehensive guide as I began to brew. One little niggling complaint I had was that there were a bunch of easily fixed grammatical errors--the wrong use of "it's" and "its" came up frequently, and it sometimes got in the way of my enjoyment of the content. Other than that, though, it's fabulous! oh my gosh - the kombucha bible! i continue to learn so much from this book and love having it on hand when i have a question! A must read! This book is a must have for the beginner brewer and is full of good info for even an experienced brewer. the info is straightforward and easy to follow giving you the confidence needed to set up your frist batch and maintain them! I have done some research while trying to get my kombucha started and Kombucha Kamps Hannah is the most well read and informative. I found this book to be so informative and well written. Everthing you need to know and more! Many books/instructions on brewing Kombucha are not as complete as this one written by Hannah. The instructions are clear and makes a new brewer comfortable enough to start brewing. This is an excellent reference book to make your experience of making kombucha less stressful. Not that one should be stressed, but something new creates a lot of questions and when you make the effort and expense of making kombucha, you want to do with as few mistakes as possible. I thoroughly enjoyed the book and recommend it even if you do not plan to make it as it is interesting to learn about this healthful, natural drink. This is an amazing resource! I have learned so much about kombucha and I know it will be my trusted go-to guide for all my brewing questions. Thank you! I spent quite some time scouring the 'net for any/all info on Kombucha and brewing it... and wound up with only a small portion of what's in this book. If it isn't in here, you're probably worrying too much, and just don't need to know. You couldn't get off to a better start than this! Thanks, Hannah! So, you want to become a bonafide, certifide, fun-lovin' boocher do ya? Well then, Hannah's your girl! This is a straight forward... tell it like it 'tis, insightful "how to" book. And, of course, it includes Hannah's fresh appealing humor!! The handbook is great. It gives a little history and everything you need to know to get started brewing kombucha with confidence. This new knowledge helps me explain the jars all over my kitchen. Yours is definitely one of the best websites ever! Reread the guide and watched the videos - extremely helpful. New batch starting today, Lots of yeastie biits which I imagine might have been part of the change in taste. Layers beginning to form on the original babies I got from you. Thanks again! Hannah's "How to Make Kombucha Tea" is concise and thorough. The step by step illustrated proceedures enable beginner brewers to start brewing with confidence. Read it frequently for any questions I might have. Answers all. I'm so glad I found your site. I made kombucha 3 years ago when I got a scoby from a friend. I followed Sally Fallon's recipe in Nourishing Traditions and made batches until I wasn't sure if the culture was good anymore. I looked for a source of scobies with no success. I made my first batch today with your SCOBY and am looking forward to sampling in a few days. Thanks for making Kombucha so accessible and affordable to the masses. Your guidebook is a great resource and I agree with your sentiments on Health and healing. Fat fat fat scooby and it got to me in just a couple of days. I haven't made kambucha before this so I cant compare it to others but it was huge! My favorite part is the Guide though, so much good information to use over and over. I've read it twice already! couln't have gotten along without this. A great resource! This was a great book. I enjoyed the history. All the information was wonderful and is a must have item. Extremely informative!!! I read the entire thing cover to cover and got more and more excited to start my brewing as I went along! I find it fabulous that theres a lot of history included, so you can appreciate Kombucha not only for its taste and over-all amazingness, but also for where it comes from and how it got here. I return to this guide over and over with any kind of question, curiosity or confusion, and its super easy to navigate through. I definitely recommend this to comprehensive guide to anyone interested in Kombucha brewing. As others have save I like not having to search for answers. Having all the info in one place makes it so much easier to manage and the info is packed in. The book is great! My only whim as that I wish it was available already printed rather than an e-book. But printing costs were only $10 and then I got a binding put on it, too. So now I'm happy holding on my lap, reading away! I purchased a full continuous brewing system from Hanna about 4 months ago. I can't tell you how much I have enjoyed brewing my own kombucha and experimenting with flavors. It's fun, delicious, healthy and way cheaper than buying bottles from the store. Thanks Hannah!! Wow! What a wealth of knowledge you've become Hannah! I appreciated that this was available for E-book reading. As someone who knew very little about Kombucha before I started reading, I felt like I received a real education on the history, health benefits and all the important how-to's. It's a great resource. Thank you. This book was a great help. I actually paid for it ahead of starting to get supplies to brew kombucha, and in hindsight I think a lot of the information is available on Hannah's site in various places for free. Having said that, it was still worth it for the convenient organized reference and to be able to get it ahead of setting up my Continuous Brew system so that I could learn and plan as opposed to getting a full kit of supplies all at once. I printed it off and will keep it in a binder for reference. This book is AMAZING!!! this book is a MUST have! Hannah teaches you everything you need to know about Kombucha and she teaches you how to make Kombucha the right way. This book also teaches you the benefits of kombucha, Hannah is an expert and if you're going to learn everything about Kombucha it's always best to learn from the experts! I think this is my favorite tool! Being in the nutrition business myself, I LOVED reading about all the health benefits, vitamins it provides, and how Kombucha helps some specific health issues. The history of how Kombucha came about was fascinating to me. This book has everything you need to learn about Kombucha, how to make it, and what this fermented tea does for your health. I put my book in a notebook and have read it several times. Thank you for this EXCELLENT resource! Everything I needed to know in one place. Very happy to be able to look up whatever I needed to know quickly. Awesome job. I had been brewing for a couple of years with the instructions that were passed on to me, which were very basic. After being on a brewing hiatus for a year, I decided to start up again. Being more conscience of what I put into my body these days, I decided to purchase the book so I could learn the science & health benefits behind kombucha. I also wanted to know that I was brewing properly so my family and I could fully benefit from drinking kombucha. I was fascinated by all of the information in the book. I learned so much & now feel much more confident in preparing and consuming kombucha. I would highly recommend this book to beginners and seasoned brewers alike. I recently purchased a scoby after failure using a dehydrated scoby that got mold. I decided to purchase the complete handbook so I would have a reference guide for any questions I might have. (the mold incident sorta freaked me out!) I am so glad I did. This book is full of information on kombucha. Hannah's style is easy to read and also very entertaining. I use my "kombucha bible" frequently for tips and tricks of the trade. I would totally recommend getting this handbook. Thank you for putting all the info in one place and making it easy to read. I need to have a quick reference guide and this one does the trick. Thanks! I read it cover to cover...you did an outstanding job. Full of facts and tips. The guide goes way beyond the drink! Can't wait to put several things into practice.